Reading time: about 16 minutes. 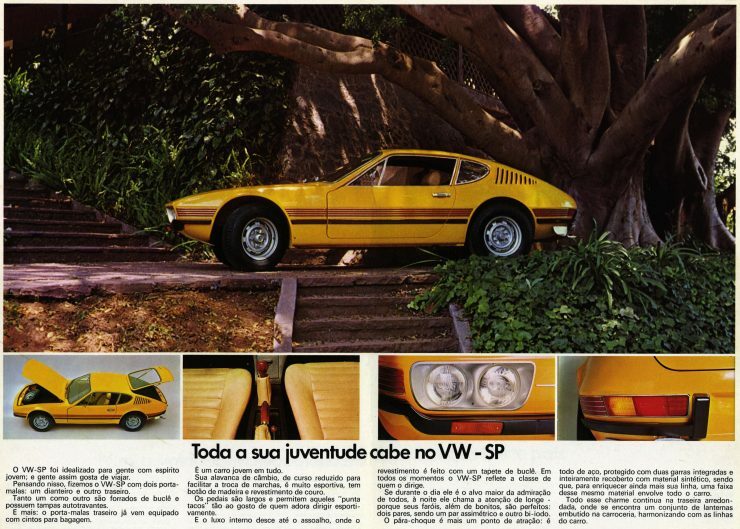 The Volkswagen SP2 is a car much loved in Brazil, but little known outside the South American country. The car is a small sport coupe that was designed and made in Brazil for the local market, using largely local VW components. 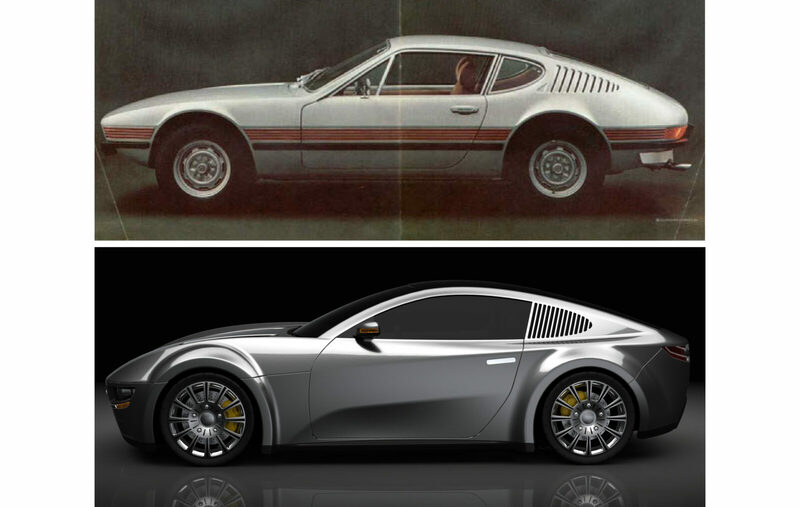 The styling of the car would have a strong influence on the VW/Porsche developed Porsche 924, and in recent years a team of automotive engineers have designed an all new SP. This turnkey design is currently waiting for a small volume automaker to put it into production, giving the SP an all new life in the 21st century. Brazil was a nation that almost entirely banned the importation of motor vehicles during the 1970’s thus forcing car manufacturers to either set up vehicle production in Brazil or not have access to that market. Volkswagen were one of the companies that set up manufacturing in the country and they finished up having a two thirds share of the Brazilian market: something that they were no doubt quite happy about, and something the Brazilians employed by Volkswagen do Brazil were quite happy about too. The other dimension to this is that most car buyers are not the slightest bit interested in purchasing a sports car. Most people want comfortable, reliable and affordable transportation. Hence Volkswagens became the most popular cars in Brazil. With the import ban in place it was a foregone conclusion that small scale specialist sports car builders would spring up. During the 1960’s a Brazilian company named Puma began making limited production sports cars using chassis of their own design with fiberglass bodywork and fitted with engines and mechanical components from DKW, Volkswagen, or General Motors. Another sports car was the Willy’s Interlagos, which was a Renault Alpine A108 built locally. 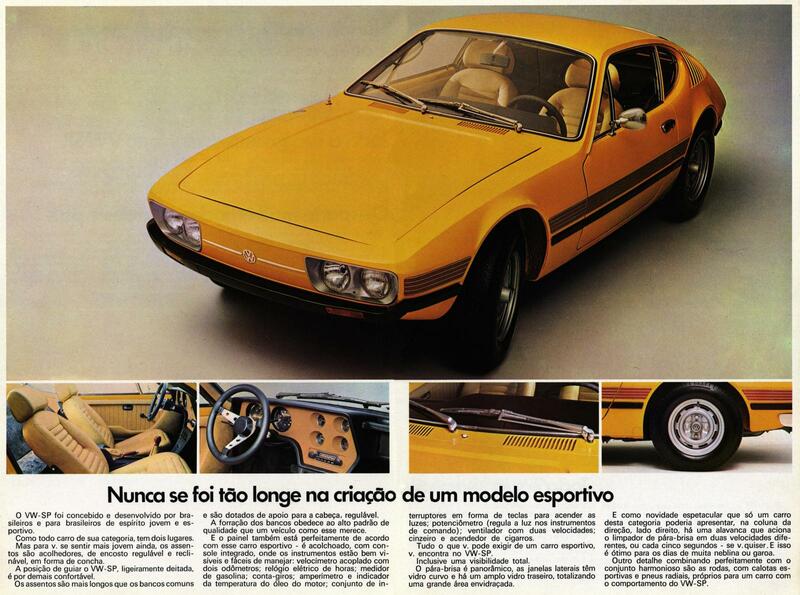 So there were sports cars being made in Brazil and they were in some ways quite like the British small volume specialist makers such as Lotus or TVR. They were cars that were fun, and affordable. 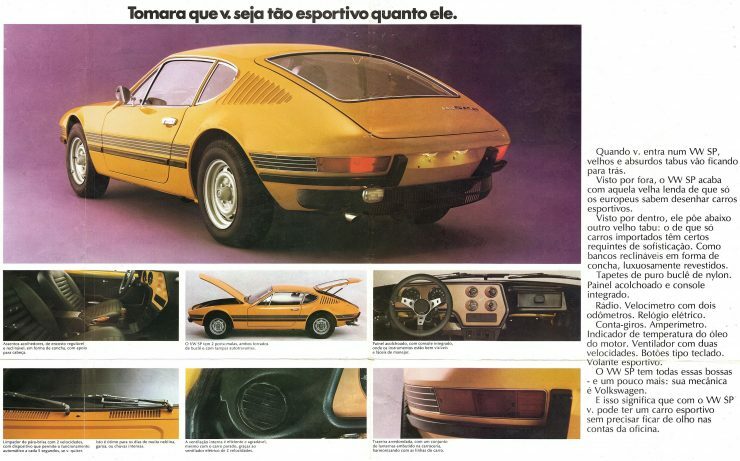 It was to be a conversation between one of the directors of Brazilian sports car maker Puma and the head of Volkswagen in Brasil that would precipitate the creation of the Volkswagen SP. The Puma director suggested that because Volkswagen Brazil did not have a stylish sports car that the pride of place on the Volkswagen stand at the 1969 Brazilian motor show should be a Puma (built on Volkswagen parts of course). The stylish coupé that Volkswagen Brazil were making was the Karmann Ghia but this was due to be phased out and the head of Volkswagen Brazil, Rudolph Leiding, could see that there was a need for a suitable replacement in the form of a stylish sporting coupé. Rudolph Leiding wisely had some discussions with his wife Helga in order to gauge what sort of stylish coupé would appeal to Brazilian women: women tend to look for different things in a car by comparison with men and Rudolph Leiding wanted the new car to appeal to both men and women. Leiding made initial sketches of the car he envisioned and a Mr. Schiemann was appointed to head up “Project X” as the new initiative was called. Volkswagen Brazil’s in-house designer Marcio Piancastelli was briefed on the project and Leiding’s sketches handed over to him. The plan was to build the new sports coupé on the platform of the locally produced Volkswagen Type 3 “Variant” which featured typical Volkswagen torsion bar suspension and four cylinder horizontally opposed air-cooled engine. For Marcio Piancastelli there was quite a bit of design inspiration available in the late 1960’s as he got to work. Jaguar’s E-Type had been called “The most beautiful car in the world” by none other than Enzo Ferrari and Japanese company Toyota had made everyone sit up and take notice when they unveiled their 2000GT. Chevrolet’s C2 Corvette was also a real head turner. Piancastelli had done an internship with Ghia and was very capable of bringing Italian style to Project X despite the fact that it was to be based on the Volkswagen Type 3 platform. Could Piancastelli design something that looked like it should be a Porsche? He was about to prove that he could and in 1971 the concept car made its debut just as Rudolph Leiding was leaving Brazil with his wife Helga to take up his new position in charge of Volkswagen globally. The Volkswagen Type 3 was actually a good foundation for a sporting coupé: it was much more sophisticated than the original Volkswagen Type 1 “Beetle” and this was especially true by 1968. By 1966 the Type 3 was made with a 1.6 liter (1,584 cc) version of the “pancake” (aka “suitcase”) four cylinder air-cooled engine. This engine had the cooling fan located at the end of the crankshaft to lower its height and was mounted on a separate sub-frame which also contained the rear suspension. This unit was then mounted to the body using rubber mountings, a design that was highly effective in isolating vibration and road noise. In 1968 this engine was the first in a volume production car to be fitted with the Bosch D-Jetronic fuel injection system. Not only that but also in 1968 a three speed automatic version was made available. The front suspension of the Type 3 was improved over the Type 1 also. The Type 1’s transverse leaf spring torsion bars were done away with and the Type 3 became the first fitted with transverse round torsion bars. For the front suspension the round torsion bar was located in the lower torsion bar tube while the upper one had the anti-roll bar attached to the upper trailing links on each side. 1968 saw another major advance with the old style swing axles replaced by a double jointed CV joint which kept the rear wheel camber consistent and eliminated the infamous handling vice of the Type 1 caused by the swing axles. The Type 3’s brakes were also upgraded to discs at the front and drums at the rear. So the Type 3 platform that Marcio Piancastelli had to work with had a great deal of potential: with the right engine under the car it could almost have become a Brazilian Porsche (of sorts). 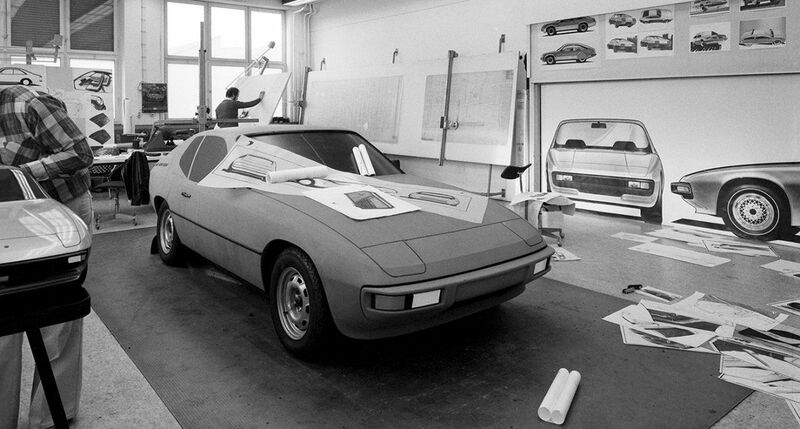 The Volkswagen SP that Rudolph Leiding had sketched the concept for and Marcio Piancastelli had created entered production in 1973 and it proved to be a real head-turner. It had looks that seemed to combine a touch of Porsche with an Italian feel. The lines of the car were sleek, well proportioned, and flowing. The interior was no disappointment either, unless you were over 6 feet tall that is in which case it would start becoming a tad snug. The dashboard was a purposeful design with a large tachometer and speedometer directly in front of the driver and four smaller gauges in the center; water temperature, oil pressure, fuel and clock. The interior was a quite brilliant blending of comfort with GT car instrumentation and controls. The SP had a lot more going for it than its looks however. 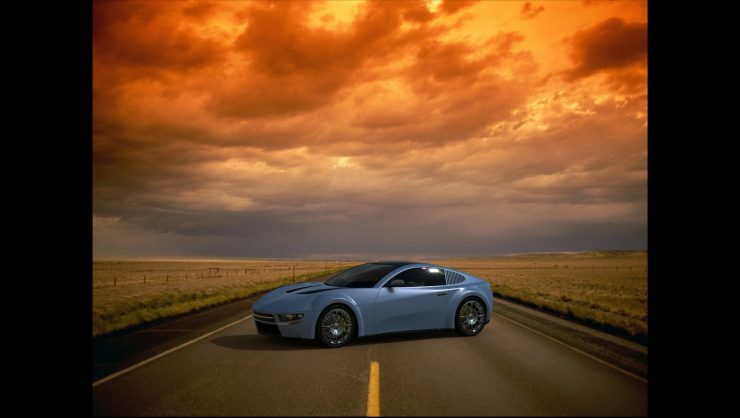 Piancastelli had design engineered it to be a car with impressive safety credentials. The steering column was collapsible, the brake hydraulics dual circuit, but the most interesting feature was the “collision belt”. The “collision belt” was comprised of “collision proof” structures that circled the perimeter of the car. The original design for the SP included the bumpers which were spring loaded by being mounted on spring steel claws which would absorb impact, especially the 5 mph impact specified by US regulators, and side structures to protect against side collisions: this feature did not make it into the Brazilian production cars however which were of polyurethane with a an inner metal core. The front, rear and side collision belt was covered in gloss painted rubber. It is very clear in the attention to engineering crash protection that Volkswagen do Brasil were intending to market the SP in the US and other world markets. The SP was made in two models; the SP1 was the entry level model and the SP2 was the more up-market model. The SP1 featured quad headlights while on the more powerful SP2 the quad headlights were quartz iodine. The car was designed to provide excellent visibility and was fitted with front quarter vents to assist with ventilation along with opening rear quarter windows also. Although the Volkswagen Type 3 in other markets was fitted with the Bosch D-Jetronic fuel injection system this was not the case for Brazil. 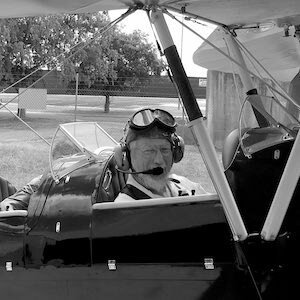 In Brazil the quality of the fuel was quite low and so the compression ratio of the engines used and their state of tune had to be kept low. Two engines were used; the Volkswagen SP1 was fitted with the same 1.6 liter engine as the Type 3 but with twin Solex carburetors and producing 65 bhp (DIN). The car also did not get the double joint rear suspension of the improved model but retained the swing axles of the older designs. The Volkswagen SP2 was fitted with a larger 1.7 liter engine also with twin Solex carburetors and producing 75 bhp (DIN). Performance of the more powerful SP2 was for a standing to 60 mph time around 16 seconds and a top speed of 100 mph. The SP1 was significantly slower and perhaps it could be said that it didn’t so much accelerate as “gain momentum”. The SP1 was dropped from production by the time 88 cars had been made, leaving the SP2 as the sole model. The Volkswagen SP had a lot more luggage carrying space than is common in the majority of sports cars or GT coupés. Because of Volkswagen engine there was a good amount of boot space above the engine, much the same amount as one would find in a Jaguar E-Type for example. But that was not all, in typical Volkswagen style there was also a good luggage area in the front of the car. The spare wheel was stored at the very front leaving a decent luggage area behind the front axle line. So as a practical coupé the SP was intelligently laid out. 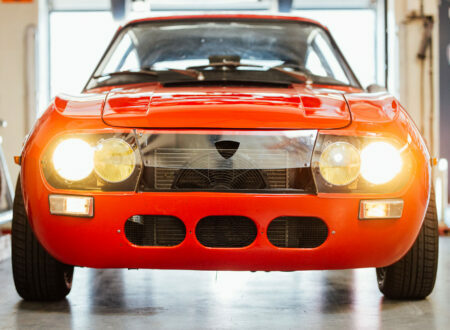 The “SP” name had originally been intended to stand for “San Paolo”, where the car was designed and made. However Brazilians have a sense of humor and pretty soon the “SP” was said to stand for “Sem Potência” which translates as “without power”, or in English we might make that “Slow Poke”. That being said those who owned the SP2 seem to have a great affection for them despite the lack of road burning horsepower. As a comfortable coupé for touring the power was seemingly enough and the car was enjoyable to own and to drive. 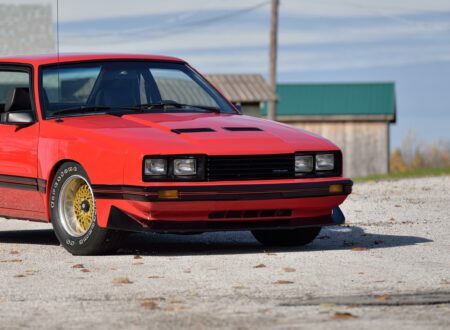 The SP2 was kept in production for three years with the last cars rolling off the production line in 1976 after a fairly respectable 10,205 had been made. Given that the SP2 was made on the Volkswagen Type 3 platform it would not have been rocket science to dramatically improve the car’s performance by fitting a larger and more powerful engine: Volkswagen certainly had a range of suitable engines that could have been chosen and which would have been easy to fit. But by that stage of Volkswagen’s history it was moving away from the 1930’s vintage rear-mounted air-cooled four cylinder boxer engines and migrating to water-cooled front-mounted engines and front wheel drive. Rudolph Leiding had been instrumental in pushing for that change and it was he who directed Volkswagen away from a Porsche designed prototype for the new Volkswagen Golf that had a mid-mounted engine. That was the EA266 which featured a mid-mounted in-line four cylinder liquid cooled 105hp engine laid horizontally and placed under the rear passenger seat. Volkswagen do Brasil did consider a suitable solution to the “Slow Poke” problem which would have been called the SP3 and which would be fitted with a 1.8 liter water-cooled four cylinder engine as used in the Brazilian Volkswagen Passat TS. That engine had a compression ratio of 8.5:1 and was fitted with twin carburetors which enabled it to produce 99 hp @ 6,000 rpm. A prototype was made by an independent Brazilian company called Dacon who offered conversion kits for SP1 and SP2 cars. Unfortunately the cost of the kits seems to have been too high and not many were sold. The Volkswagen SP had garnered quite a bit of attention in Brazil and in Volkswagen/Porsche circles. 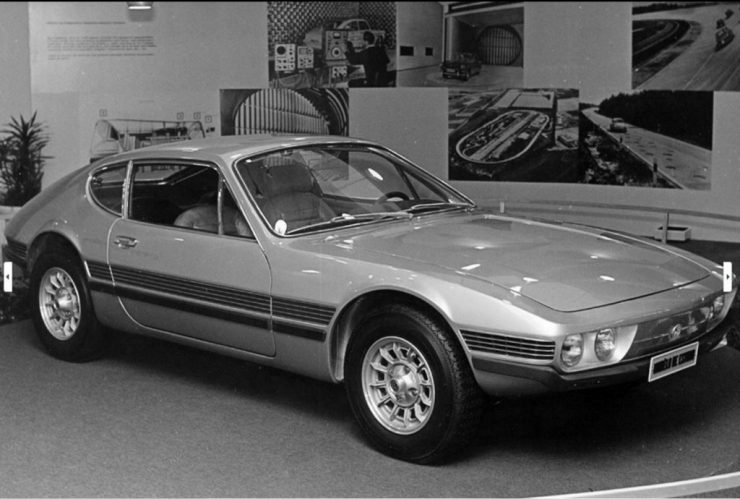 Although the Volkswagen SP only remained in production in Brazil for three years the idea got Volkswagen in Germany thinking, helped along by Rudolph Leiding in his role at the head of Volkswagen internationally. The idea for a Volkswagen sports car/coupé, that Leiding had instigated and developed in Brazil was embraced by Volkswagen in Germany and work began in cooperation with Porsche to create a suitable model, whose design was very much inspired by the Volkswagen SP. 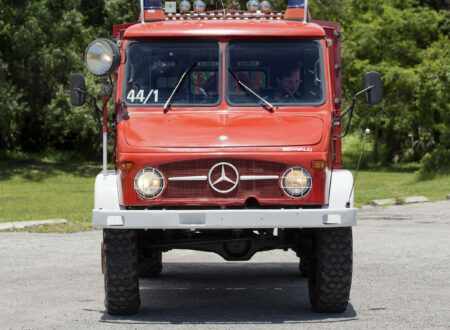 The project was designated EA425 and it re-located the engine to the front of the car with a transaxle at the rear: this gave the car a 48/52 front to rear weight distribution. With a successful and very affordable design largely complete the EA425 was ready to rock and roll off the assembly lines but the oil crisis of 1973 persuaded Volkswagen to stop work on the project and sell it back to Porsche while Volkswagen moved ahead with their Scirocco model. Porsche completed the car as a replacement for the Porsche 914 and introduced it as the Porsche 924 in 1976. 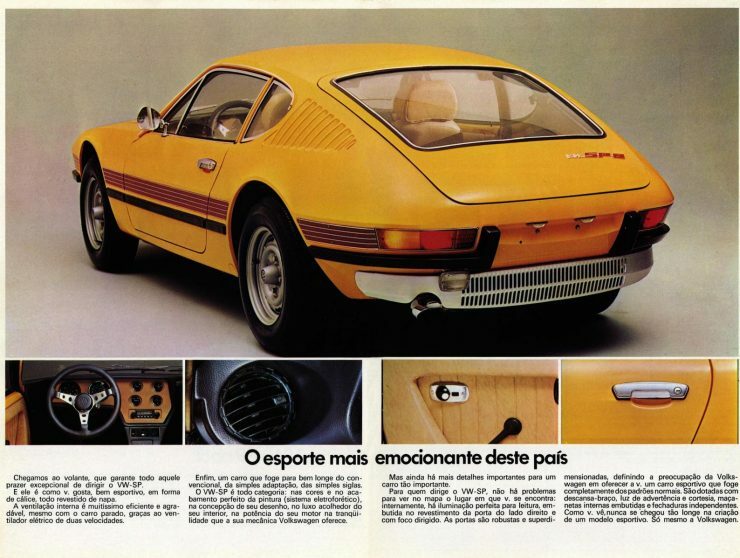 The Volkswagen SP may have been nicknamed the “Sem Potência” but it carved a place for itself in many Brazilian hearts as their home grown sports coupé that was almost a Porsche, and which in reality had been transformed into the basis for the Porsche 924. So it should come as no surprise that in this twenty-first century that a group of Mechanical Automotive Engineering students at the FEI College (Educational Foundation of Ignatius) in Brazil decided to base their course major project on it. Final year students in this course were required to design a vehicle and its major components as a major assignment. Around the table a group comprising Rafael Tardelli, Fernando Piaya, Rafael Juncioni, Flavio Koiti, Sebastián Honbono and Marco Diniz, looked at various options and considered that there had been a move to recreate “retro” style cars, such as the Ford Mustang, Chevrolet Camaro, Morris Mini and Fiat 500 “Bambino”. 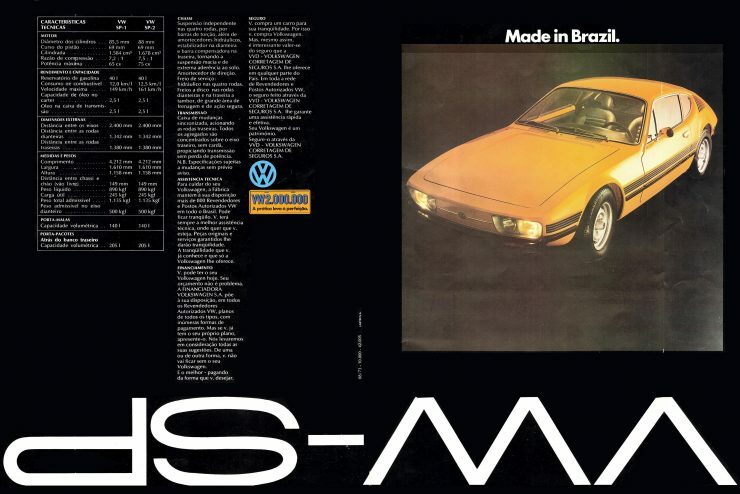 So as the discussions progressed the group decided that they could create a new version of Brazil’s Volkswagen SP that had almost become a Brazilian Porsche. The student’s professor of vehicular dynamics and suspension, Mr. Ricardo Bock, was also teaching the Car Design Course, at the FAAP College (Armando Alvares Penteado Foundation) and finding that the retro Volkswagen SP2 project to be a very interesting one brought students from the two colleges together. Professor Bock’s idea was to have the engineering and design students work together to actually create a design that could be built. The meeting brought together not only students but professors who had been working in the Brazilian car industry during the 1960’s and including Brazilian designer Ari Rocha, who worked at Studio Fissore and at DKW. 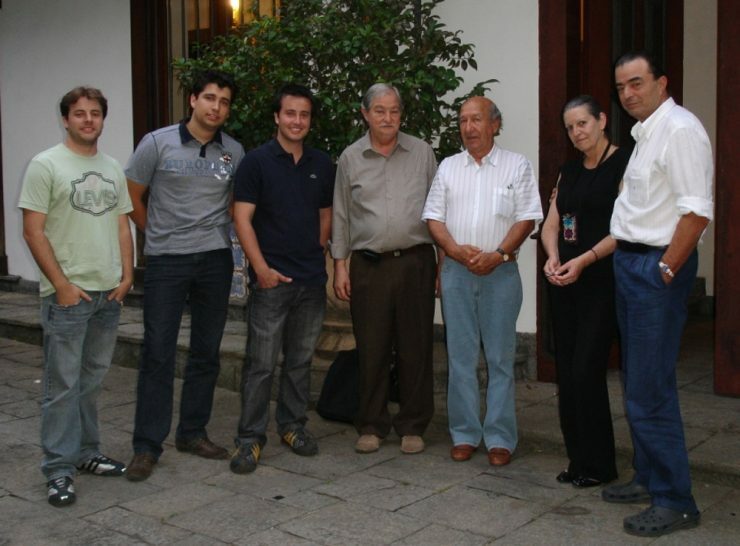 It was he who subsequently introduced the students to the designer of the Volkswagen SP2, Márcio Piancastelli, and also to José Vicente Novita Martins (Jota) who had designed a number of Volkswagen cars. Armed with background drawings, photographs and time spent with original designers from the 1960’s and 1970’s, the students went to work to create the design for a new version of the Volkswagen SP2, and they designed it so it could be built and driven. 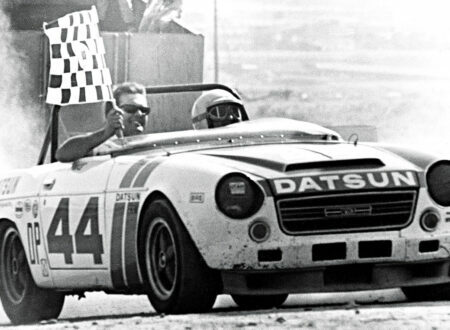 They used a tubular space frame chassis as is common for small scale sports car producers. The 1020 steel tubing was to have an external diameter of 50.8mm with a wall thickness of 2.5mm. Suspension was to be by unequal length wishbones, “A” arms at the front and “H” style at the rear. Brakes would be discs all around. The choice of engine remained with a standard Volkswagen/Audi engine, and the students chose the 1,984 cc, turbocharged, TFSI (Turbo Fuel Stratified Injection) engine which produced 195 kW (262hp) @ 6400 rpm and torque of 350 Nm (358lb/ft) at 3500 rpm. The design team decided that the engine was to be mounted in the center (i.e. mid-mounted) and so it would most likely be mated to a transaxle as used for a front wheel drive car, but with the unit in the mid-engine position driving the rear wheels, in a similar set-up to the Lamborghini Muira. The SP Concept design is 4,143.43 mm long, 1,810.00 mm wide, and 1,191.00 mm high. 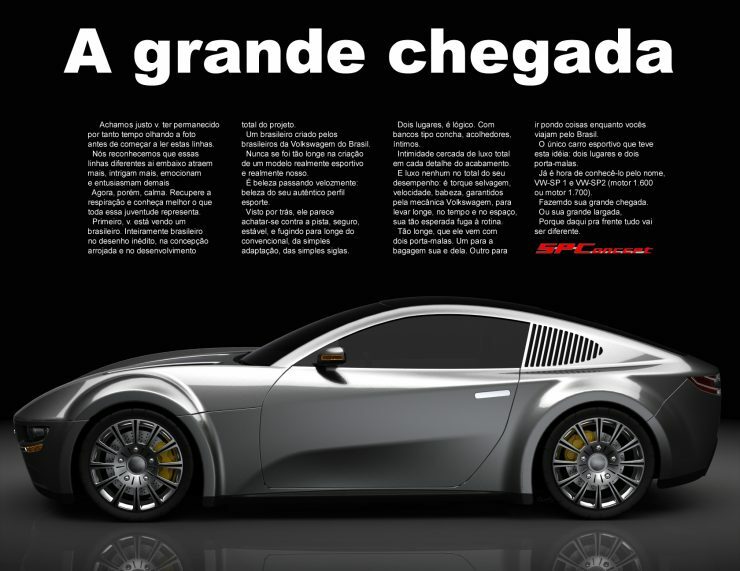 Given that this new SP would have more than triple the engine power of the original SP2 there is no way that this car could be called “Sem Potência”, in fact “Super Performance” might be more apropos. 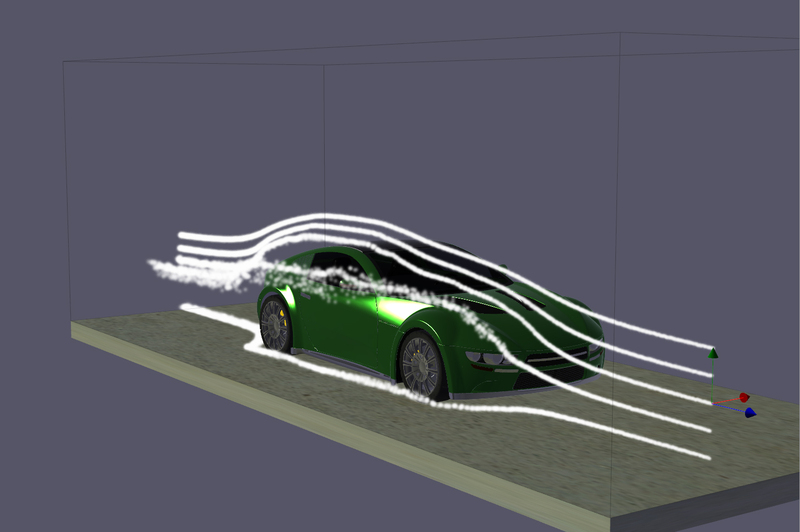 In computer simulated wind tunnel testing the SP Concept achieved a respectable drag coefficient of 0.34. Overall the design looks to provide great stability, including high speed highway stability, and with its fully independent suspension should also provide excellence in handling. 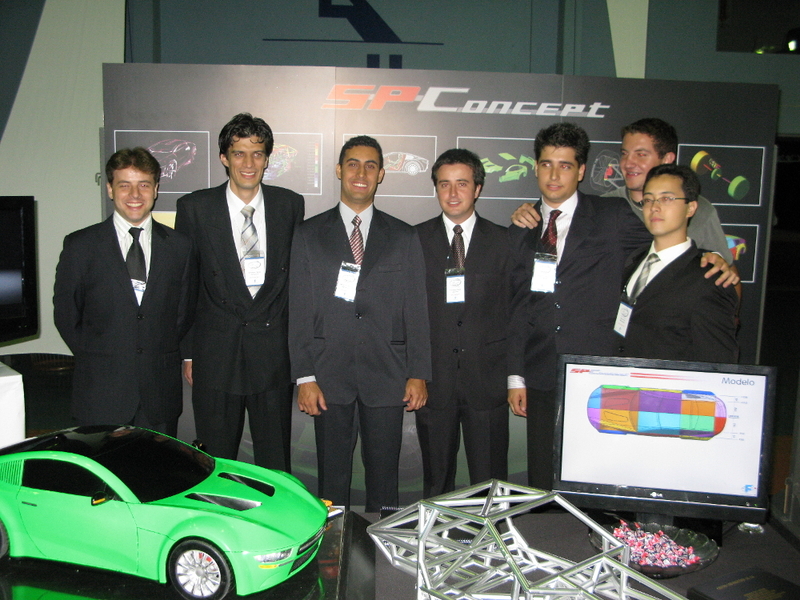 The students had a student named Rafael Reston refine and improve on the 3D modeling of their car and created a 1:5 scale model which they presented at a college event in 2003. Their design was much admired, being awarded the “Best Car” of the event. 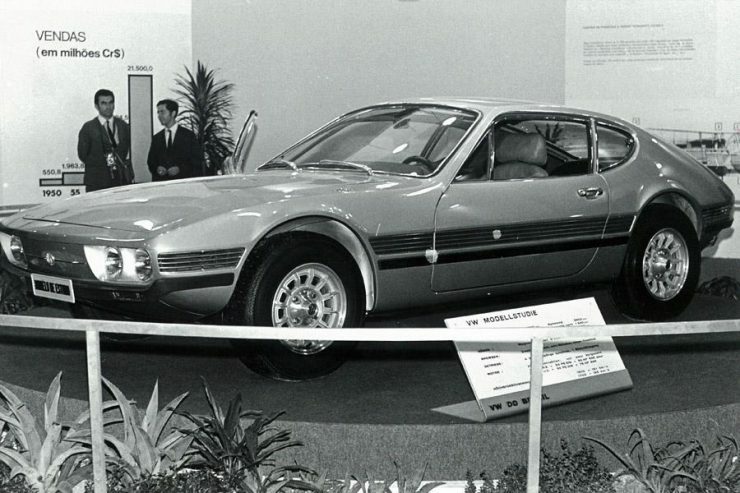 This SP Concept was a fitting tribute to those who designed the original Volkswagen SP2, and also to the Brazilian automobile industry that had achieved some remarkable things in the period when importation of cars was almost totally banned. 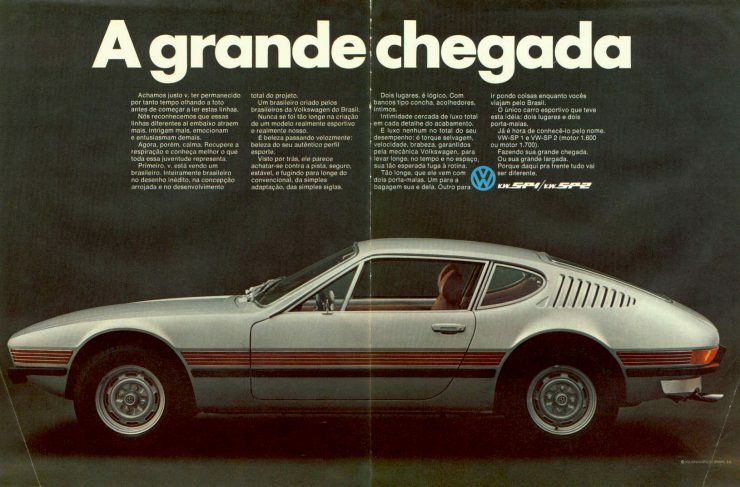 Despite being labelled “Sem Potência” the Volkswagen SP2 was not only a successful touring coupé but it was also the car that gave us the Volkswagen EA425 concept and then from that the Porsche 924, which was a car that realized the potential in the Volkswagen SP design. The college student’s SP Concept car demonstrates that the original vision is not dead, and perhaps there will be a small scale car manufacturer who takes a serious look at it with a view to making a new sports coupé. Much of the hard design work is already done by a team of professional engineers, and the final car is a genuinely beautiful coupe that’s already winning the hearts and minds of those who see it. 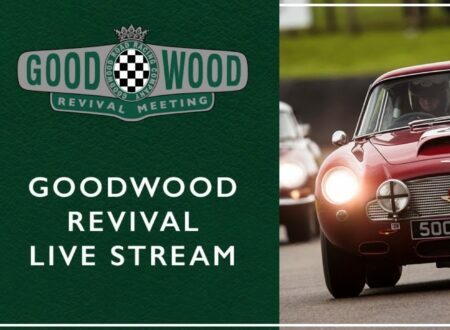 If you’d like to get in touch with the design team with a view to building the car you can contact us here and we’ll put you in touch with them.